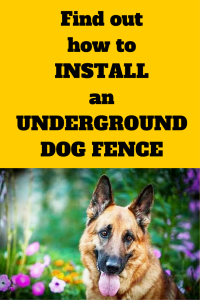 Do you want to know how to install an underground dog fence? Then you’re in the right place! What tools can make your job easier. 2 situations where you might want to leave your wire above ground. Why upgrading your boundary wire can minimize the risk of wire breaks. 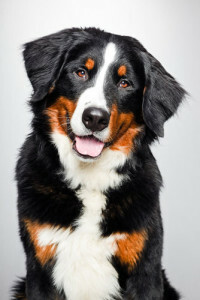 What extra components consumers recommend for an underground dog fence. For starters, it’s important to know that installing this type of electric dog fence takes time and effort; depending on the size of your containment area you can expect to spend anywhere from a few hours to a full day getting your fence up and running and some people even make it a weekend project. When it comes to installing your fence there are 2 main ways to do it: You can either bury your wire underground or you can leave it above ground. Because most people prefer to bury their wire that’s the method we’ll run through first. Installing a wired dog fence isn’t as easy as just going out into the yard and burying the boundary wire. Some of the most important steps are the ones you do before you bury the wire. 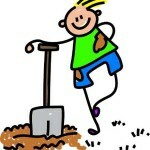 Sketch out your layout, taking into account any underground utility lines or wires so you can avoid hitting them when you’re digging. Choose a location for your transmitter and install it. One of the most important things to remember is that your wire must make a complete loop around the perimeter of your dog’s containment area, starting and ending at the transmitter. To facilitate this you’ll need to place the transmitter in a location where you can easily run the boundary wire outside, such as a window or a hole you’ve drilled in the base of a wall. Lay your boundary wire out along the perimeter of your containment area and test the system to ensure you have a fully functioning loop. Connect the wire to your surge protector (if you’re using one). Connect the wire to your transmitter. Set the boundaries of your dog’s containment area using the controls on your transmitter. Test your dog’s collar along the fence line to ensure ensure everything is working properly. Nothing’s more frustrating than burying your wire only to find out that the system isn’t working. You can avoid this by testing the collar before you bury the wire. Once all that’s done you’re ready to dig your trench and bury your wire. So those are the basic steps involved when installing an in-ground dog fence. If you’d like to know more, this article from the Home Depot goes into more detail about how to install an underground dog fence. Alternately, if you’d prefer to see the set up process in action you can check out the video below. Although it refers specifically to a PetSafe fence, the steps are the same no matter what brand of DIY electric dog fence you buy. This underground dog fence comparison page gives you a side by side comparison of various fences as well as links to their reviews. Are There Any Tools That Can Make Installing An Underground Dog Fence Easier? Power edger: Digs the trench for you so all you have to do is lay the wire and bury it. Trencher: Does everything for you — digs the trench, installs the wire and then covers it — all at once. A circular saw and masonry blade will make your life easier if you’re running your wire across concrete or asphalt. In addition to that you’ll also need some sort of waterproof caulking so you can put a seal over the exposed wire. If you’re like me and don’t have those tools lying around the house 😉 you can check your local home improvement, hardware or gardening store for rental options. Above Ground Installation: Why Would You Choose This Method? If you already have a traditional above ground fence such as wood or chain link. The most common reason in this scenario would be to stop your dog from digging under or jumping over an already existing fence. If you simply don’t want the hassle of burying the wire. 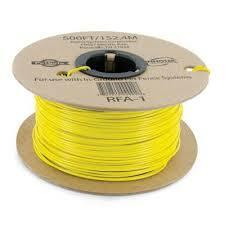 If your wire will be in a high traffic area or a grassy area where you’ll be regularly running a lawn mower over it. If you live in an area where there are lots of wild animals. Exposed wire is more susceptible to damage from wild animals. How Do You Install Your Wire Above Ground? The steps are basically the same as a buried wire installation with one exception: Instead of burying your wire you will secure it to either an existing fence or the ground. If you’re attaching your wire to an existing fence any type of haevy duty zip ties or dog fence staples work well. If you’re securing your wire to the ground dog fence staples are the best way to go. You can get both these items at your local home improvement or hardware store. If you prefer to shop online, Amazon has competitive prices and you can check out their wide variety of dog fence staples here. When it comes to boundary wire it’s important to understand that the larger the gauge, the thinner the wire. So, for example, 20 gauge wire is thinner than 14 gauge wire. Most DIY fences come with 500 feet of 20 gauge wire which is enough to cover about 1/3 of an acre. The problem with 20 gauge wire is that it’s extremely thin and fragile; professional installers call it ‘dental floss’. Because finding and repairing a break in the wire can be a frustrating and time consuming endeavor, a lot of people pay extra money upfront and upgrade to a thicker 16 or 14 gauge wire, especially if they have a smaller area to cover. To them, more money upfront is worth less headache in the long run. If you buy your fence from a major online retailer you’ll most likely have the option to upgrade to a thicker wire when you purchase your fence kit. As long as you’re using burial grade wire, it doesn’t matter what brand you buy. Amazon has a large selection of different gauges of wire and they also sell kits which contain everything you need to extend your coverage area. You can find more information and pricing details on Amazon’s boundary wire and kits here. Having said that, you can also find burial grade wire at most local home hardware and home improvement stores and buying it there might save you a bit of money, especially if you have a large area to cover. There are 2 grades of boundary wire: A lower quality wire, sometimes called ‘manufacturer grade’ and a higher quality ‘professional grade’ wire. Either grade wire will do the trick for your in-ground dog fence but the difference is how often you’ll be repairing breaks or replacing the wire over time. The manufacturer grade wire comes standard with pretty much all DIY dog fences. It’s 20 gauge and because it’s lightweight, it cuts down on shipping costs. 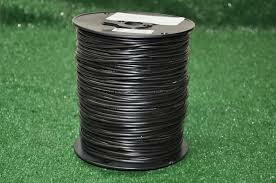 But it’s also a thinner wire than professional grade and it has a thinner outer jacket. For those reasons it breaks easier and may not stand up to the elements as well as professional grade. The professional grade will cost you more but in return you get a much higher quality heavy duty wire that’s got a thicker outer jacket and stands up better to things like freezing temperatures, exposure to water and general wear and tear. Tip: If you’re installing your wire above ground you may want to go with a thicker wire, especially if you’ll be regularly running a lawn mower over the wire or if it’s in a high traffic area. The last thing I want to mention about boundary wire is this: If you have a large area to cover, it’s a good idea to buy 1000 foot rolls of wire if you can. A common consumer complaint is that the wire gets tangled as it comes off the roll and this is especially true for thinner gauges of wire. That might sound a bit picky but if you have 25 acres to cover you’ll be dealing with thousands of feet of wire and having to stop and untangle it on a regular basis can be really frustrating. Basically, fewer rolls equals less hassle. Whatever gauge wire you decide to go with, the chart below shows you approximately how much wire you’ll need, depending on the size of your containment area. Keep in mind that this chart is for a basic perimeter around the outside of your yard so if you intend to have exclusion zones you’ll need more wire. What Other Components Do Consumers Recommend? One of the biggest concerns I came across in the consumer reviews was damage to the transmitter caused by lightning-induced power surges. A surge protector can protect your transmitter from this type of damage and if you live in an area prone to electrical storms and lightning strikes this is one item you definitely want in your shopping cart. But you can’t just use any old surge protector…it has to have ports to plug the boundary wire into. There are several brands of surge protectors that work well for most brands of underground dog fences, including PetSafe’s LP-4100-1, IMPI’s Lightning Surge Protector and Panamax’s Max2. Depending on which brand you choose and where you buy it, a surge protector will run you anywhere from about $25-$60. Considering the cost of a replacement transmitter is $150+, it’s easy to see why a surge protector is so highly recommended! Your wired dog fence needs electricity to run. If the power goes out, your fence stops working and your dog will be free to leave the yard without receiving any type of correction. To prevent this, manufacturers recommend an Uninterruptible Power Supply, aka UPS. A UPS is simply a battery backup that will kick in and keep your fence running for a set length of time should the power go out. Your local home improvement and hardware stores probably carry a selection of Uninterruptible Power Supplies and you can also find them at many of the major online retails stores such as Amazon. Underground dog fences definitely take some time and effort to install and maintain so if you’d prefer something easier check out these wireless fences. They’re quick and easy to set up and have very little ongoing maintenance. And if you’re still not sure, this article can help you decide which type of electric dog fence is right for you. But if you want to completely customize your containment area, an underground fence is the ideal solution for you. In addition to keeping your dog inside a set perimeter you can also have exclusion zones that keep them out of off limits areas such as pools, flowerbeds and gardens. Despite all the work involved with this type of electric dog fence, ending up with an outdoor playpen that perfectly fits the size and shape of your yard is tough to beat!